Photograph from Simon & Schuster. Some stories only get more potent with time. That can definitely be said for the new Netflix and BBC One-produced retelling of “Watership Down”. Based on the classic 1972 children’s novel by Richard Adams, this colorful but anxiety-fueled limited series drives home its allegorical themes with little left to the imagination. 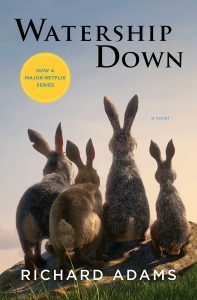 Set in the South of England, a small band of rabbits seek to find a new place to call home when one of them has a horrific vision of incoming destruction. As they make their journey, they encounter a multitude of horrors such as rabbit cults, a murder of crows, cars, enslavement and a brutal authoritarian regime. This adaptation keeps its viewers on the edge just as our cute rabbit heroes navigate a world full of ever-present death. Even from the first scene, which encapsulates a creation myth of how the rabbits came to be, the heavy tone is hammered home. The audience is made aware of the burden that all rabbits must endure: being hunted by everyone and everything. But only if the enemy can catch them first. Just as in the novel, the rabbits have a fascinating culture and social structure with storytellers, warriors and chieftains populating their ranks. God and Death go by revered names such as “Frith” and “The Black Rabbit of Inel.” This aspect from the book lends a certain fantasy-like element that certainly has helped propel this story to be one of the best of children’s fiction. Backed by an incredible cast of top-tier British talent such as James Mcavoy, Nicholas Hoult, Jon Boyega and many others, this CGI odyssey is beautifully produced with care to the book in terms of its themes of community, love and standing against political oppression. However, for this first-class production, character development seems to take a back seat in favor of frightening action sequences and tension-filled power struggles. Don’t be fooled by the PG rating, this adaption carries strong themes that will fly over the head of younger viewers and those sensitive to animal-on-animal violence even of the CGI variety. You may want to proceed with caution. For those seeking a fresh revisit to a classic that has only gained more relevance in our uncertain times, there is something to be found among the roots and warrens.